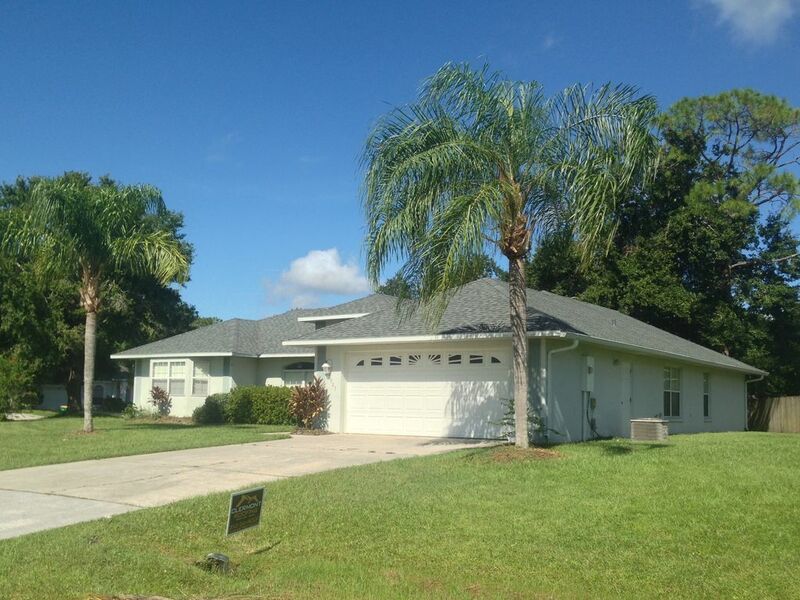 This home is located close to Disney, Orlando/Kissimmee and the Central Florida attractions. Come and enjoy the freedom of a home rental rather than the restrictions of a hotel. This property is on an oversized lot, in a residential vacation rental area. The home has an alarm system if you wish to use it and the doors out to the pool all have pool alarms. A book is supplied in the home to give you information on the area, access routes to the parks and grocery/shopping places. Publix (grocery) is 5 mins away along with fast food and dining in that plaza, or use the 24 hour walmart - two to choose from less than 10 mins from the home. Perhaps you want to shop the Malls/discount outlets or flea Markets - there is a lot to choose from!. The 192 resort area has an ambundance of fastfood, buffet style, family and fine dining. Out back steak house, Red lobster, Italien cusine,Chillis, Ruby Tuesdays, TGI Fridays,Olive garden, Logans Grill, Chineese restaurants and buffet, or perhaps choose one of the many hotel restaurants - perhaps a character breakfast! NEW guest service - We HAVE FREE NATION WIDE CALLING, INCLUDDES CANADA AND PURETO RICO - FREE WIRERLESS HIGH SPEED INTERNET for the duration of your stay. It is a short drive( Direction in the book in the home) to all the Disney Parks - 15/20 mins (Magic Kingdom,Epcot, Hollywood Studios, Animal Kingdom, Blizzard Beach) or visit Seaworld, Aquatica, Universal Studios, Islands of Adventue, Wet and Wild, or one of the many Dinner shows, of the famous Cirque Du Soleil. There are many other activities to do not forgetting mini golf, movie theatres( At the Loop and Pleasure Island), Downtown Disney, The Orlando Science Center, and Orlando art exhibts/Museums - see a show/play or concert. An often overlooked area of Orlando is the oppotunities to watch wildlife - Gators at Gatorland, or bird watching at the Nature conservancy and lake front. Get first hand knowledge with Kissimmee Valley Audubon on their filed trips or monthly meeting - free. Walk/hike many of the nature trails in the area - the enviromental center is close by or visit the Birds of prey/refuge center in Maitland. There is always horse back riding at the nearby stables, or take an airboat ride, Kayak from many boat ramps or on shingle creek which leads to the Everglades. Forever Florida is a great family day out and has a Zip cord run plus a Swamp buggy tour- see the real Florida. Green meadows petting farm and zip line is close by - plus the Xtreame Paint ball experience. Perhaps do some local fishing or hire a guide. We have info and brochures to help you make your plans. Kissimmee Lake front park has just been re developed - great for some family time at a slow pace! This house is professionally managed, by a company close to the property, and maintained including pest control, to a high standard. The lawn and pool are looked after by liscensed companies. We have received a high number of repeat or referal bookings. Our rentals are based on satisfied clients. Call or e-mail Michelle to ask any questions you may have, or make a reservation. We are members of the Kissimmee St. Cloud Visitors Bureau. Payment: $100 will confirm your reservation and put the house in your name for your dates. The remaining balance is due 60 days prioer to arrival. We acept Visa, Master Card , USA Dollars or Sterling. We have a secure link for payment by credit card or e-check thru the rental web site. You can also mail the balance as a personel check. We have a UK address that Sterling checks can be mailed to - to accomodate the many reservations we take from the UK market, or online bank transfer to Barclays . All beds are made up ready for your arrival. High speed - wireless and free!!! Come and get your work done whilst on the pool deck! 2 living areas - family room with cable TV - has 2 x 3 seater sofas with view of the pool. Second living area has 2 sofas with TV. With breakfast bar and stools, plus nook table and chairs that over looks the pool area. Pool deck has room to relax and eat outside, access is from both bathrooms and living/kitchen area. Dining room has view of the pool area. Courts just a 2 minute walks away. The Oaks golf course has great rates - or try out any of the other excellent courses a short ditance away. This homes is well equipped and very spacious, has 2 living areas, a separate dining area, plus a nook table and chairs to also dine at. We have a collection of novels and information books on the area. The property can be renteded by the day, week or month. Enjoy the community pool as a well as your own pool which can be heated , plus there are tennis courts. Check out our reviews! We enjoyed our stay very much. The house was perfect for us and wasn't far from any attractions in the area. Communication with the owner was very open. We would definitely recommend staying here. Love the layout of this home. particularly the French doors leading out to the pool instead of sliding doors. Also the direct access doors from the pool area to both bathrooms. This home has lots of conveniences. Well stocked kitchen., bath towels and pool towels. The home is clean and nicely organized. The location is perfect. Close enough to attractions but just outside of the crowded areas. We enjoyed our stay very much. We will definitely be back next year. The house was great! Lots of room. Nice pool. convenient location. It’s close to everything but yet out of the hustle and bustle. We were 30 minutes from Sea World and an hour and a half from the beach. The house was really nice with lots of room. Just make sure you bring toiletries, paper products and products for washing. There were none. We had a great time! We will definitely be back! Beautiful home! Easy access to surrounding parks/stores although it’s a bit of a drive. Owner always available for questions or concerns. Would happily rent this home again!!! Although it was just 3 of us, this house would be perfect for a large family or even two couples. The split bedrooms and open floor plan are wonderful. The pool was great. The house was about 25 min from Disneyworld but it was a very easy drive. This house beats a hotel hands down any day. Check in and check out were easy peasy. We will be back for sure! Stayed for 4 nights. About 40 min. drive to Universal Studios Theme park. Lots of room. 2 eating areas & 2 sitting areas definitely a plus. Would use again if in the area. If you wish to book, we are a preferred partner, offering Homeaway payments. Most guests prefer the option to not pay a refundable damage deposit of $200 but take out the damage protection policy for $59. If this does not suit your group - just e-mail Michelle. Please note any pool heat is extra, a separate line on the quote. If you instant book Michelle will e-mail you to check if you wish to add the pool heat.